The natural sweetness of red peppers counteracts any need for a salty soup. 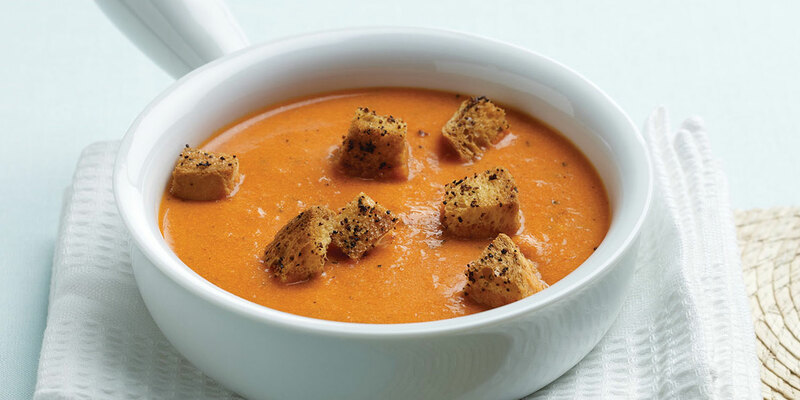 Flecks of the Italian seasoning are so attractive in this warming soup. This soup can be made a day ahead or frozen up to the point before adding the milk and cream. Thaw in the refrigerator overnight and place in a saucepan to heat through. Add the milk and cream. The croutons may also be made one or two days in advance. Preheat the oven to 425°F. Coat a baking sheet with 1 teaspoon of the oil. Halve and seed the bell peppers. Arrange them cut side down on the prepared baking sheet. Toss the remaining teaspoon of olive oil with the onions. Spread the onions on another baking sheet in a single layer. Place the tray of peppers on the oven’s upper rack and the onions on the lower rack. Roast the peppers for about 40 minutes and the onions for about 30 minutes. Stir the onions occasionally. Remove the vegetables from the oven and let cool. Peel off and discard the pepper skins. Transfer the peppers and onions to a food processor or blender and process until smooth. Add 2 tablespoons of the chicken stock or water if necessary to make the mixture smooth. Heat the 1 tablespoon of olive oil in a large saucepan. Add the garlic and sauté over medium-low heat for 2 minutes. Add the Italian seasoning and sauté for 1 minute. Add the pepper puree, milk, and stock. Bring to a simmer and simmer over low heat for 10 minutes. Add the cream and simmer 1 minute. Season with freshly ground black pepper. To prepare the croutons: Brush each piece of French bread with olive oil. Cut each slice into 1/2-inch cubes. Sprinkle each cube with the Garlic & Herb seasoning. Bake for 4 to 6 minutes at 400°F, until lightly toasted.